Most residents will fulfill the Royal College academic training requirements through the Master of Health Science (MHSc) or Master of Public Health (MPH) degree programs in their first year of residency training. Note that the MPH may take longer than one academic year to complete. Prior to starting either program, courses required for the Public Health & Preventive Medicine Residency Program should be discussed with the Program Director. 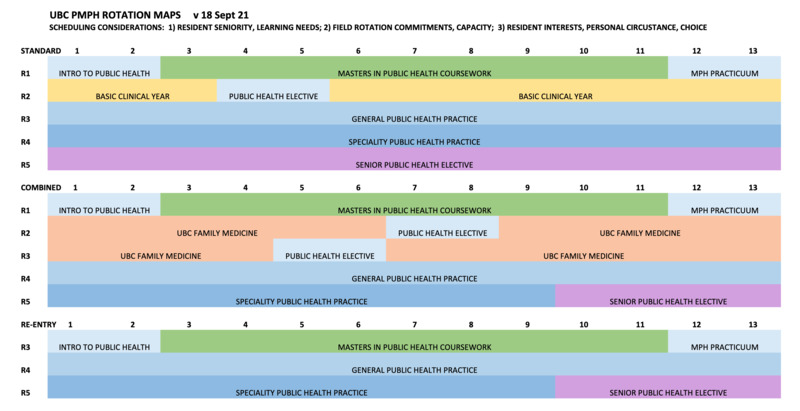 The MHSc and MPH degrees follow the UBC academic year and start in September. As the residents’ year is usually July 1 to June 30, the first two months of that year are spent in a Field Rotation. All residents in a postgraduate degree program must be enrolled in and meet the requirements of the Faculty of Graduate Studies including the payment of required fees. The applicant should be aware that application and tuition fees are not covered by the PHPM program or waived by UBC. Residents are expected to attend SPPH 570/710 each Friday afternoon at the School of Population and Public Health. This is a formal course designed to cover important content areas in Public Health & Preventive Medicine and develops proficiencies in oral and written skills to prepare residents for their Fellowship examinations. Residents may also be asked to attend occasional meetings or other Public Health & Preventive Medicine events on Friday mornings. Those engaged in Graduate Studies at SPPH are required to attend weekly Grand Rounds each Friday morning during the Academic Year. Journal Club – A resident-led discussion on either a current issue in public health, a review of public health content in a priority journal or a formal review and critique of a recent research publication of public health relevance. A resident will present on the assigned topic for the day, drawing from primary course textbooks and commonly-used reports or frameworks as developed by public health agencies. A presentation and discussion led by a guest-speaker who will speak to the practical applications of the topic in public health practice. During the summer residents may go on field trips during some Academic Half Days. Examples of such trips include visits to correctional centers, landfills, watersheds, abattoirs, and a port authority. Residents entering the program directly from Medical School will enter into the academic year of the residency and will complete their Master of Health Science or Public Health. Following the Master’s degree, there are two possibilities for clinical training. Residents can do one basic clinical year or obtain certification with the College of Family Physicians of Canada via the UBC Family Practice Residency through two years of clinical training. Please contact the Public Health & Preventive Medicine Residency Program Director regarding this possibility. The final decision for location of clinical training is made by the PGY-1 Coordinating Office or the Associate Dean of Postgraduate Education. Residents choosing to spend one year in Basic Clinical Training will have an additional year for public health-relevant rotations.